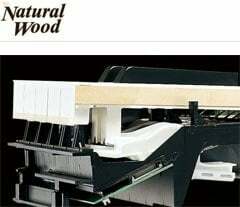 In addition to the NW(Natural Wood) keyboard with synthetic ivory keytops, the 88-key Linear Graded Hammers reproduces the unique weight of each key over the entire keyboard. A GP Response Damper Pedal gives you the same sense of control as a grand piano and the RGE Sound Engine provides exquisite playing response and tremendous expressive power letting you to play however you want. The audio design has been reworked from previous models including an additional subwoofer so that during ensemble performance, the low tones of bases and kick drums are reproduced with even greater intensity. From professional piano performance to simply discovering the joy of music for the first time, the CVP-609 can fulfill anyone’s piano playing dreams. Real Grand Expression, with the dramatic resonance of a deep subwoofer, plus a rich supply of instrument Voices provide incredibly natural and realistic-sounding performances. By harmonizing the three key elements of sound, touch and pedals in a single piano, the CVP Series gives you the feeling that you are playing a grand piano. The RGE Sound Engine delivers the ultimate expressive capability. The Clavinova uses the RGE (Real Grand Expression) Sound Engine,the next-generation piano sound source. This lets you enjoy the playing response and expressive capability of a concert grand piano.It features a new Smooth Release function which can express sound with great clarity, and clearly enunciate staccato notes with the sound of lingering resonance heard when gently lifting your fingers from the keys. It succeeds in capturing the essence of a piano performance to create grand piano-like, richly expressive experiences. Subtly reproduces resonance with the depth you hear from an acoustic piano. Clavinova subtly reproduces even the unique resonances of an acoustic piano. It features String Resonance that expresses themellow sounds of the other strings resonating, and Key-Off samples that actually deliver the delicate change in sound the instant the damper touches the string, just before you raise your finger from the key. The addition of these sounds results in tonal resonances that are not only beautiful, but also deep and rich. Experience real piano touch with Yamaha’s Natural Wood keyboard. Pianists enjoy a touch that clings firmly to their fingers, just like the ivory keyboards historically used in top-class pianos. Synthetic ivory keytops feature a soft, slightly porous surface that gives all keys added grip and natural friction for improved ease in playing, especially during long performances or practice sessions. The keys’ smooth,refined texture imparts a feeling of luxury and is easy to clean. 88-key Linear Graded Hammers reproduce a unique weight for each key, a first for digital pianos. The GP Response Damper Pedal provides an authentic grand piano pedal feel. The damper pedal is an important piano-playing element because it continuously varies the sound as you press it down. The Clavinova provides acoustic piano behavior by constantly detecting the amount of pedal travel and finely adjusting the amount of note elongation and reverberation. 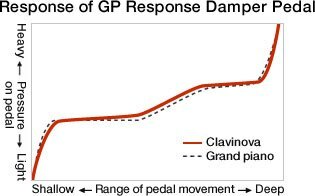 Additionally, the GP Response Damper Pedal reproduces the typical grand piano feeling, for example less resistance when starting to press and a heavy feeling when the pedal begins to take effect. As a result, players achieve greater control when operating the damper pedal. Piano Room: your choice of piano and location. The CVP-609 offers a great new feature called Piano Room that you can use when you really want to concentrate on piano performance and savor the piano sound. You can select from among four types of pianos – grand, pop grand, upright and honky-tonk – and also a playing location, such as concert hall, cathedral or stage. Instantly, the tone quality changes to match that piano and place, giving your performance a totally different feel. 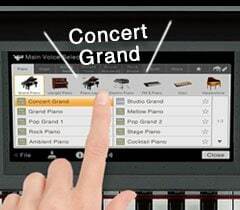 When you’re playing the grand piano or pop grand, you can even choose to have the “virtual” piano lid open or closed. The CVP Series provides many instrument Voices, in addition to piano.Have fun playing different sounds, and producing the expressiveness unique to each instrument. Super Articulation 2 Voices reproduce true effects, as if you are playing that actual musical instrument. Yamaha’s Super Articulation Voices that provide genuine performance attributes of non-keyboard instruments are now supplemented by an even more extensive set of enhanced Super Articulation 2 Voices. SA2 Voices automatically add the nuances unique to each instrument. For example, legato, glissando and vibrato in wind instruments and the new SA2 Violin. Moving smoothly from Voice to Voice, you’ll achieve performances that sound like they’re naturally performed by a virtuoso of that instrument, instead of from the keys of a piano. Accompaniment Styles let you play along with virtual bands in numerous genres including rock and jazz. Change the Style and you can perform the same piece with a completely different mood. Music Finder is useful when you can’t decide on the right Style or a Voice for ensemble performance. All you have to do is choose the name of the song you want to play and the CVP will call up the proper settings so you can get playing right away. Style Recommender allows you to quickly find a Style that suits the way you want to play. Just play a bar or two of a simple rhythm, and a list of Styles that match it will be displayed. On-Screen score display shows you what to play and when. Follow along with the bouncing ball shown on the score as you play, to be sure of never losing your place. Enjoy performing − even if you’re just starting out. The guide lamps wait until you play the correct note, so you can practice at your own pace. Plug in a microphone for vocal performances. Plug in a microphone, and you can sing along with your playing.Play accompaniment to your own composition, or play along with a talented friend. Singing will add more fun to your home parties. You can enjoy karaoke backed up by songs stored in your Clavinova or downloaded from the internet. The lyrics are shown on the display*, and the letters change color as the song advances, so it’s perfect for bursting into song. 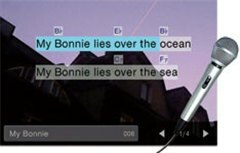 Display the lyrics on a big TV screen so everyone can join in and the party will pick up steam. * Only if the song data includes lyrics. Enrich your vocals with harmony. Vocal Harmony 2 (VH2) offers advanced sounding harmonies. It lets your vocals enrich with the lush harmonies of a chorus, applied to your singing voice.Also VH2 provides matching effects like Delay or EQ on your songs easily, so you can enjoy your vocal performance much more. 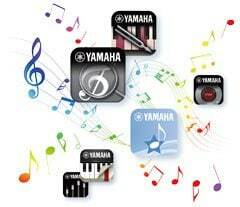 If you use an iPad, iPhone or iPod touch, Yamaha apps will make playing more convenient and enjoyable. Play a song and easily set the ideal Voice and accompaniment Style. Record your own performance and share it with a friend. Check out the apps and find the ones that meet your needs.Note: Some apps require a connection to your instrument. To use apps connectivity, a wireless* or wired connection (with Yamaha i-MX1) are necessary. *Wireless connection requires a wireless router and the bundled USB wireless LAN adapter. The USB wireless LAN adapter may not be included depending on locale due to local regulations. Visit our Yamaha MusicSoft online store to browse thousands of playalong songs designed to help you play your favorite songs by your favorite artists, following the notes and chords you play on your keyboard. A diverse collection of accompaniment Styles put a professional band at your fingertips. Styles are great for practice or performances, and are a handy songwriting tool as well! Controlling functions is easier than ever, giving you immediate access to what you want to do. The easy-to-understand user interface has a touch panel that makes it simple to operate. Other buttons are laid out in easy-to-see and -reach locations on the control panel. The CVP-609 is simply unrivaled for ease of use. You can use Voice Guide with version 1.20 or later. When Voice Guide is active, the instrument gives audible information on the current display or operation being executed, allowing those who have visual impairments to enjoy playing and using the instrument. Note：* You can download the firmware version 1.21 at Yamaha Download Site. Click the Support tab on this page. * When using Voice Guide, make sure that the USB flash memory containing the Voice Guide files is connected to the instrument. * The audible information of the functions / screen supported by the Voice Guide is limited. Customize your control panel as you like. – Bookmarks for your favorite Voices and Styles.- Shortcuts on the Home display.- Assign your favorite functions to the ASSIGNABLE buttons. The USB Audio Recorder* to record your performances on a USB flash memory for storage on your PC. This lets you compare two different performances to gauge your progress, or listen to them on a portable music player. * Stored in WAV, MP3 format. [Other Functions]- Pitch Shift : Change the key without changing the tempo. – Time Stretch : Slow down or speed up the tempo without changing the pitch.- Vocal Cancel :Cancel or suppress signals like vocals and solos that exist in the center of an audio file. Delivers powerful bass for greater enjoyment of ensemble performances. The acoustic design has been reworked from previous models including an additional subwoofer so that during ensemble performance, the low tones of bases and bass drum are reproduced with even greater intensity. From professional piano performance to simply discovering the joy of music for the first time, the CVP-609 can fulfill anyone’s piano playing dreams. “Intelligent Acoustic Control” provides a full, balanced sound with rich lows and clear highs even at low volumes. Volume adjustment is convenient for playing at home, where sometimes others may prefer you to play softly. You’ve probably experienced the fact that when the volume is low, it is difficult to hear treble and bass. 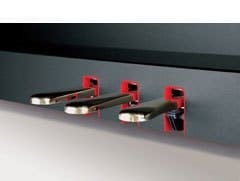 On a Clavinova, however, the Intelligent Acoustic Control (IAC) automatically adjusts the sound, so you enjoy proper sound balance even at low volumes. Additionally, the volume dial automatically makes fine adjustments to the overall sound of the speaker system (EQ) at low volume. This ability to adjust volume without losing the rich and balanced sound is an exclusive Yamaha benefit, ensuring you always play with the utmost sound quality. Yamaha’s latest sound engineering technology, “Acoustic Optimizer”. The “Acoustic Optimizer” system has been created to enrich and control resonance by physically adjusting the flow of sound waves, thanks to its design and positioning within the instrument. The combination of Acoustic Optimizer and digital technologies gives the CVP Series an incredible expressive capability. A piano appearance with the benefit of many advanced features. When the key cover is closed, your CVP has the calm ambience of a piano. When it is open, you see an efficiently laid out control panel. CVP-609 features the traditional strong points of the CVP Series that let you explore new ways to enjoy music, along with the genuine expressiveness of a piano.